The Sweet Dreams Sonic racing car bed frame in a white finish features a handy under bed storage drawer and shiny chrome effect wheel trims. 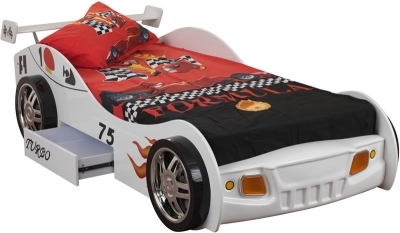 Fun and practical the Sonic turbo racing car theme bed is perfect for a child with a keen interest in sporty cars. The rear spoiler adds the finishing touch to this wonderful racing car theme bed, it also doubles as a cleaver minimal headboard and pillow stop.